So I've been wanting to try my hand at the Ink "Smooshing" Technique. I have seen several crafters do this recently, and I wanted to give it a try as well! I gave it two tries, and the second try I filmed for a How To Tutorial. The stamp set I used is a new one from Mama Elephant called Friend, Indeed! This stamp set has quickly become a favorite!! I love it hear from you if you have tried out the technique!! Thanks for taking the time to stop by! hello!! 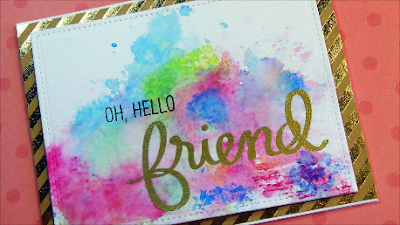 I wanted to share with you a fun colorful card I made using the Birthday Balloons Stamp set as well as the Big Scripty Greetings stamp set from Simon Says Stamp. I stamped all of my balloons using Lawn Fawn inks! Absolutely LOVE these inks!! They are great for beginner stampers as well!! For my background I used the new MFT Balloon String BG stamp and inked it up using Hero Arts Wet Cement ink - I didn't want to use a black....I felt it would be too much for the background, and I really wanted to have the balloons stay the "star of the show" if you will! Once all my stamping was complete, I adhered my panel that I die cut using the Stitched Square die from Lawn Fawn and placed that onto my 5 x 5 inch card base. To finish up my card, I added some Clear Wink of Stella brush pen!! Here's a close up of all that beautiful shimmer! Below is my video tutorial of how I put this card together! !